I hope you’ll forgive me if I consider the mystery short-story writer the unsung hero of murder and mayhem. Mystery novelists earn fame and fortune writing books where four or five characters are killed at most. The short story writer of the genre eliminates that many characters every morning before breakfast. I am not complaining. It’s what we do. Besides, I’m a Canadian and for us the unsung hero is the best of all. We even have an organization called Unsung Heroes Anonymous with chapters all across the country. I can’t tell you if I am a member or not because our bylaws prohibit it. The heart (or heartlessness if you prefer) of the short story is its small cast of characters. Not for us the novelist’s convenient red herring the stately butler, for with him come the maids, footmen, and the whole damned Downton Abbey crowd. Off with all their heads! No room for Ali Baba and the Forty Thieves, either. They’re just more heads to roll before we can begin. Yes, the mystery short-story writer is wading in blood before he sets his first word to paper. But enough about me. Let’s talk about you. If you want to find out if that story was a success or not you can dig up the June, 1975 issue of EQMM and judge for yourself. Wait, let me spare you all that trouble. By lucky chance I just happen to have reprinted “Bianca and the Seven Sleuths” in my latest collection of stories A Dirge for Clowntown by James Powell (Kindle e-book, 2012). By the way, I did pull one of my dwarf crew out of this story for a career on his own. Harry Grundig’s several adventures also appear in the same collection, where he operates Aardvark Investigations, a name he chose in order to give himself top place in the P.I. listings in the telephone book. And you’ll also get to meet Inspector Bozo of the Clowntown police and see how many clowns he can get out of a compact short story. Though again it is not a mystery story—some even call it a novella—you might say Robert Louis Stevenson goes Poe even one better (or one less) with “The Strange Case of Dr. Jekyll and Mr. Hyde,” where there is essentially only one character. Ideally, I guess the best mystery story would involve that favorite of magazine cartoonists everywhere, two people on a desert island. One of them ends up dead. Is it murder? Did the coconut fall from the tree or had it been pushed? Did the stingaroo, the deadly leaping jellyfish, leap out of the water or had it been thrown? (And just in case this bit of information might come in handy some day, they can be thrown. The trick is to grab them by their dorsal fin, spin them over your head several times, and throw.) To get back to our castaways, could one of them hate the other enough that the thought of being marooned there forever might be enough to drive him to suicide. But his hatred runs so deep that he plans the act so that it looks like murder so if rescue ever came his rival would be charged with the crime and spend the rest of his life in prison. Another possibility, let’s suppose they both get this idea and kill themselves at the same time. There’s the perfect short story. Two dead bodies. Well, people die everywhere. Even on desert islands. No characters at all, right. The only problem is where’s the detective? You can’t have a mystery without a detective. No, it’s a bottle, a pot-bellied glass bottle, and it’s heading this way. When it comes ashore the cork pops out and what have we got? A cloud of smoke that condenses into Inspector Genie of the Arabian Knights as that country’s crack police force is called. Now we’re getting somewhere. He’s pacing up and down examining the corpses, counting the coconuts in the tree, scanning the waters for the dorsal fin of the deadly stingaroo. He’ll solve this case in no time at all. Hold it. He’s on his cell phone. He’s calling for backup. Can you believe it? In a moment there’s going to be the clicking of a thousand bottles washing up on this little island. Okay, look, give me a fleet of stepvans and I think maybe I could handle Ali Baba and the Forty Thieves. Maybe. But a thousand and one Arabian Knights? No thank you. This looks like a case for Captain Balloon-Juice, champion of the long-winded. Somebody call a novelist. Hiho, hiho, it’s off to work on another short story this writer goes! 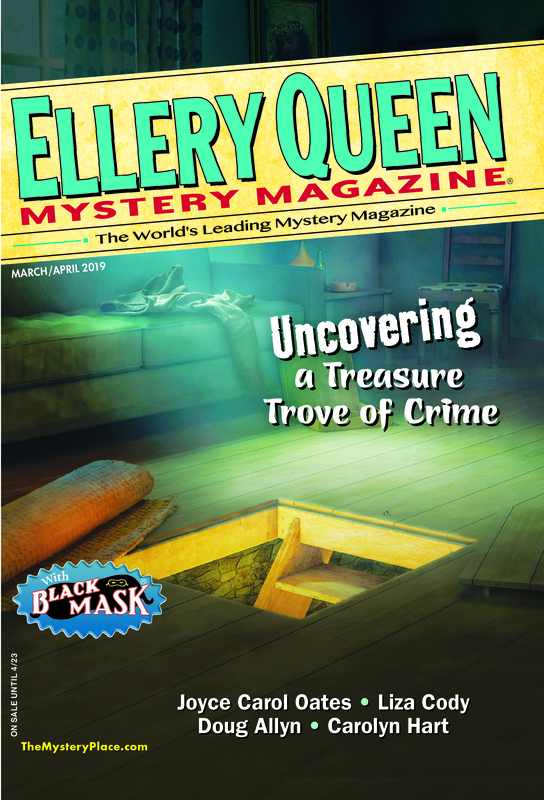 This entry was posted in Adventure, Books, Characters, Editing, Fiction, Guest, Novels and tagged characters, elleryqueen, fiction, literature, short stories, short story, writing_technique. Bookmark the permalink. Jim Powell has definitely been hitting the bslloon juice. What an imagination! I would e happy if i could put as many wild ideas into ten stories as he casually tosses out in one. Bravo for the small cast of characters in “Tightrope Act”– EQMM’s Sept/Oct issue!